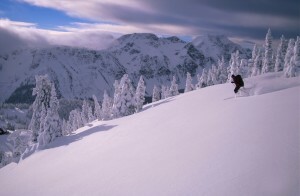 Backcountry skiing in Wells Gray has been a well guarded secret among the locals for decades. With an average snowfall of 10 meters per year, the average compact base of the alpine is usually about 3 meters. Terrain is a great mix of alpine, sub-alpine and naturally gladed trees, and lends itself to all skiing abilities. The best way to experience the fantastic back country skiing opportunities is to go with a guided outfitter like Wells Gray Adventures. Please call or email the information center for more details. Call the Information Centre at: 250 674 3334.